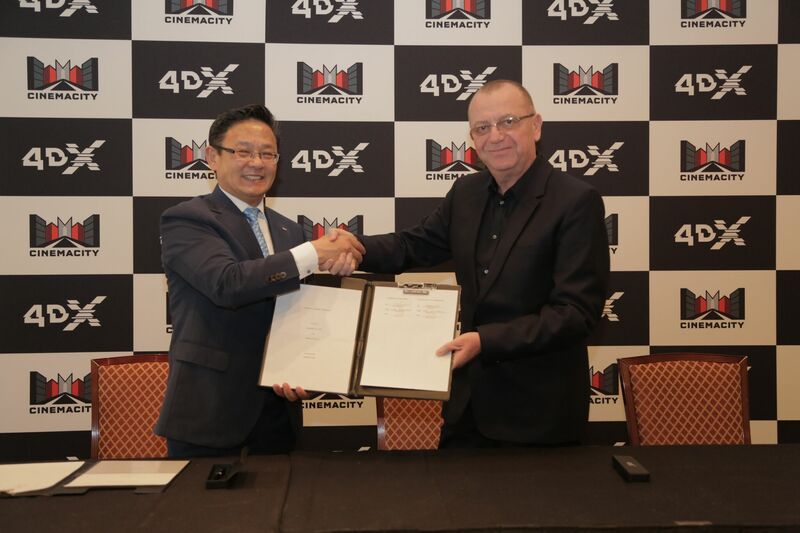 Seoul, South Korea (April 25, 2018) – CJ 4DPLEX (www.cj4dx.com) has signed a new partnership with Cinemacity, the leading cinema exhibitor in Saudi Arabia, further extending the reach of 4DX in Middle East. Through this deal, three 4DX locations will open in the country’s capital city, Riyadh, and other major Saudi cities by the end of this year. Al Qasr Mall will be our first Multiplex in Riyadh, featuring 19 screens. It is expected to mark an average of 750,000 admissions during our first year of operation catering to individuals from all walks of life that enjoy luxurious and quality entertainment. Cinemacity’s parent company, Xclusive Cinemas SAL Holding, will operate 116 screens by the end of 2018 in five countries including Jordan, Lebanon, Syria, the UAE, and soon, in the Kingdom of Saudi Arabia. “Here at Cinemacity, we strive to be at the forefront of entertainment excellence, providing our guests with a top tier cinema-going experience on all fronts. We are proud to partner with 4DX and provide patrons with 4DX’s state-of-the-art immersive entertainment systems that will distinguish us in the market, and add to our brand as a whole,” said Karim Atassi, Vice President of Business Development of Cinemacity. “With this upcoming debut in Saudi Arabia and further expansion in this region with Cinemacity, we will reach to the Saudi’s untapped market and lead cinema revolution in progressing immersive cinema into the future,” said Byung Hwan Choi, CEO of CJ 4DPLEX. CJ 4DPLEX is the world’s first 4D cinema company, headquartered in Seoul with international offices in Los Angeles and Beijing. The company created 4DX, the first and leading 4D cinema technology for feature films, providing moviegoers with an immersive cinematic experience that utilizes all five senses, allowing the audience to connect with movies through motion, vibration, water, wind, snow, lightning, scents, and other special effects that enhance the visuals on-screen. CJ 4DPLEX brings 4DX auditoriums to exhibition partners along with 4DX codes for both major Hollywood blockbusters and local titles. Each auditorium incorporates motion-based seating synchronized with more than 20 different effects and optimized by a team of skilled editors, maximizing the feeling of immersion within the movie, beyond the limits of audio and video. Since 2009, more than 520 Hollywood and local titles have been screened in 4DX. As of April 2018, more than 61,000 4DX seats operate in 500 auditoriums spanning 59 countries. CJ 4DPLEX was named a Most Innovative Company of 2017 in Live Events by Fast Company.The conpany was awarded the silver Edison Awards in the Media and Visual Communications-Entertainment category in 2015 and 2018. For more information, please visit www.cj4dplex.com. Cinemacity is a subsidiary of Xclusive Cinemas SAL, a leading cinema developer and operator in Middle East and GCC region. From concrete to furniture, Xclusive Cinemas works from conceptualization to operation of world class luxury cinema theaters for a movie-going experience like no other. Founded in 2005 by CEO Hammad Atassi, Xclusive Cinemas operates screens in Lebanon, UAE, Jordan, and Syria, with plans to open multiplexes in the Kingdom of Saudi Arabia in 2018, reaching 116 screens by years end.